Aundh is an area we all love for its bustling streets, greenery and vibrant atmosphere. No wonder, there is no dearth of shopping and eating establishments. Team LBB visited the Baner-Aundh link road and found out that so many eateries and cafes have opened up there that it has turned into a cafe gully. While there were more than ten eateries, we shortlisted eight places. Take a look which cafes made it to our list and their signature specialities are. This European place has a quintessential cafe-next-door feel clubbed with bright yellow doors, charming planters at the entrance, a glassy live kitchen beside the seating area, low-drop lights and a counter full of sweet treats, macaroons, pastries and more. We tried the Bloody Mary spaghetti, which was made of classic Pomodoro and braised lamb shank served with minted pea risotto and sauteed courgette. Vegetarians, we recommend you try the seitan steak with a side of crispy potato fries and balsamic tomato sauce. 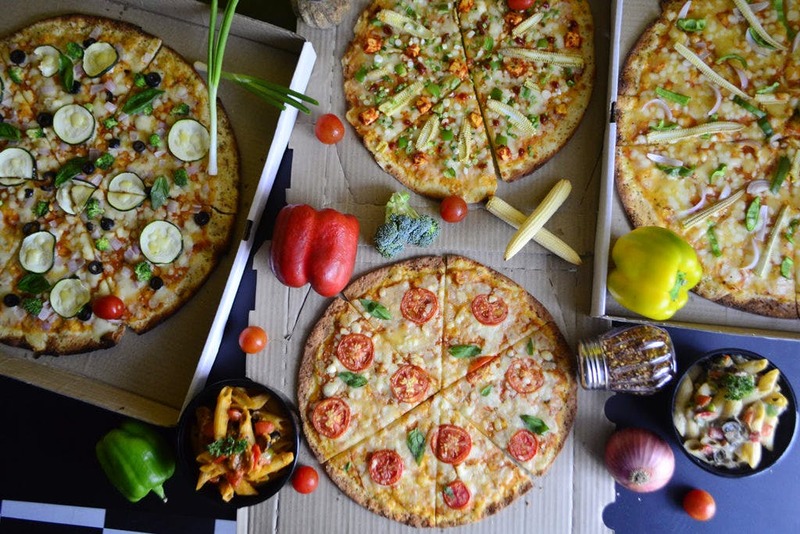 If Italian cuisine is your thing, you must try the thin-crust pizzas from Basilia, a quaint all-vegetarian pizzeria that even meat-lovers love going to. Think thin-crust pizzas and creamy cheesy pasta, and you’ve got it all at Basilia. Their Hawai pizza has sliced juicy pineapple, fiery jalapenos and caramelized onions is a must-try along with a side of crispy nachos smothered in tangy salsa sauce. Another pizza that we absolutely loved was the sun-kissed Margarita topped with sun-dried tomatoes, olives, basil and ricotta, dressed in olive oil. Good news is that the pizzas start at just INR 79! Giving ten different flavours and twists to the humble chicken wings, The Odds Bar is taking the culinary game to the next level. From the founders of L'Dorado Food Truck, this food bar is satiating all the chicken-wing lovers out there. We tried the bacon-wrapped chicken wings which had Southern American spices and the richness of bacon as well as the pulled mushroom sandwiches that were creamy and delicious. They have many options in Italian Cream Sodas which have a tangy aftertaste. This newly-opened restaurant has become a part of the cafe gully. With cute, brightly-lit interiors and a menu full of comfort food options, Cafe Soosha is the place to visit and relax with your gang. Their menu consists of chat items, beverages, sandwiches, burgers, pizzas and paratha combos. We tried the aloo tikki chat and it had a lovely street-food feel. We loved the paratha combos that you can have if you feel like ditching regular food. With salad, pickle, dal and chole/paneer, these paratha combos make for a lovely brunch platter. Don't be fooled by the humble appearance of this small eatery for it is big on taste and Indori flavours. Indori Spices is known to show you a glimpse of Indore right here on Pune. They serve Indori delicacies like poha, dal bafle and many more. At just INR 70, you can also enjoy a fulfilling thali. We tried a piping hot plate of jalebis and desi-ghee gulab jamuns and they were heavenly. Sweet, rich and with loads of ghee in them, the sweets made our day. This Instagrammable, super-pretty cafe has a food-truck -type menu and we are not complaining. Foodaddy is known for adding delicious flavours to regular pasta, sandwiches and burgers. Did you know the place has amazing options for mocktails? We tried the pink & orange mocktail that had the goodness of several juices concocted together. For food, we had the veg pink sauce pasta and a bhuna chicken wrap in alfredo. The best part is that the rates are inclusive of taxes. If you pair up your food with a drink and create your combo, they offer you a discount of 20%. Baner-Aundh road has a new parking spot. Except here, you can park yourself in front of It's Recess Time. Pune’s new food truck is a double-decker that offers a grab-and-go menu. Think: rolls, subs, burgers and the likes. One more thing, there is a super-adorable seating area above the double-decker bus! We found the Mexican salsa paneer roll, tequila lime chicken burger, soya barbeque sub and the freaky fish sub as interesting options to order for a first visit. There’s also soya kebab, tandoori leg and fish tandoori on the menu. They’re also serving 3 Sisters non-alcoholic beer and your regular aerated drinks for now. Whenever we craved for eggs, Andaground, a food truck came to our rescue. Not only it satiated our hunger under INR 200 but also exposed us to a whole new culinary world of eggs. Now it is a restaurant in Aundh and we cannot be happier. With more than 100 varieties of egg dishes, it was very difficult for us to zero in on few items. The best part is that they have retained the food truck menu along with the restaurant one. We went for the Australian fry, cheese & egg grenade as well as a green-apple mojito and had a hearty meal.